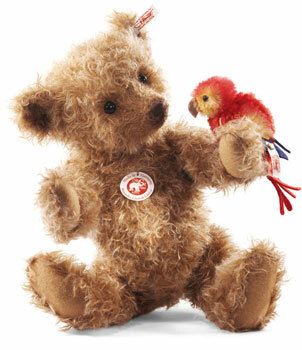 Steiff Alexander Teddy Bear Discounts Apply ! Our Alexander Teddy Bear is named for Alexander von Humboldt, a Prussian scientist whose work on botanical geography laid the foundation for the field of biogeography. Humboldt explored Latin America thoroughly and published extensive volumes about his study over 21 years. The Alexander bear is made of a new mohair blend material, used for the first time by Steiff for this bear. On Alexanders paw, an intricately made parrot sits proudly made of mohair and wool felt with extensive airbrushing. This Teddy pays tribute to a true pioneer in the exploration of one of the worlds greatest Paradise Jungles. Fully Jointed, safety eyes and stuffed with synthetic filling, gold-plated "Button in Ear". and Surface Washable.